I will be offering an evening class along with the morning session. In this class students will draw the Portrait from observation in graphite. Emphasis will be placed on accuracy of Block-in. It is in the understanding and practicing of the visual tools of blocking-in, students will develop their comparative measuring and shape-seeing abilities. Focusing on block-ins is a traditional academic training method that allows one to fine tune foundational skills for high accuracy. Each student will get a chance to organize a strategic method of thought and process to develop a clear approach to drawing. Demos are given by instructor and one on one instruction through out the course. Beginner and experienced students are welcome. This class is meant to be a continuation of the prior weekend Block-in class for students that want to take their block-ins and learn to use charcoal to render 3 dimensional form. Emphasis will be placed on accuracy of Form Modeling. Students will be introduced to the principles of Light on Form. Discussions and demonstration will be presented on the pitfalls of purely visual observation and are introduced to a more conceptual way of seeing. Each student will get a chance to organize a strategic method of thought and process to develop a clear approach to drawing and value modeling . For students who wish to just take this class in Modeling form without the Block-in workshop prior can. They will just need to create the block-in on first day and should have previous drawing experience. 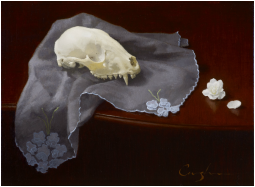 In this class students will draw and then paint a still life that they set up. Students will learn how to set up a pleasing set up and composition with good lighting. Then students will work on getting an accurate block-in drawing in graphite, from which they will do an oil transfer to canvas. Then students will learn how to paint form modeling to achieve a three dimension effect using hue, value, chroma. We will talk and use a string method and the mussel system. Each student will get a chance to organize a strategic method of thought and process to develop a clear approach to painting in color . Learn to draw the Figure from observation of a live model in graphite. Emphasis will be placed on accuracy of block-in. It is in the understanding and practicing of the visual tools of blocking-in that students will develop their comparative measuring and shape-seeing abilities. Focusing on book-ins is a traditional academic training method that allows one to fine tune foundational skills for high accuracy and likeness. Each student will get a chance to organize a strategic method of thought and process to develop a clear approach to drawing. In this class students will draw the Portrait from observation in graphite on Toned paper. Emphasis will be placed on accuracy of Block-in and Form Modeling. It is in the understanding and practicing of the visual tools of blocking-in, students will develop their comparative measuring and shape-seeing abilities. Focusing on block-ins is a traditional academic training method that allows one to fine tune foundational skills for high accuracy. Once the block-in is complete we will move to the Form Modeling stage. Students will be introduced to the principles of Light on Form. Discussions and demonstration will be presented on the pitfalls of purely visual observation and are introduced to a more conceptual way of seeing. Each student will get a chance to organize a strategic method of thought and process to develop a clear approach to drawing and value modeling . ​Three days to understand and practice the visual tools of Blocking-i. Starting with a 2-dimensional reference via Figure Plates by the Charles Bargue's Drawing Course. From there the next two days are spent developing comparative measuring and shape-seeing abilities while working with a live model. ​The goal is to have a better understanding of the systematical approach to blocking in a drawing through traditional academic methods. This, in turn, will fine tune ones foundational skills for higher accuracy. Working from a live model, students will study the classical figure tradition of understanding the structure of the human head. Students will begin with the foundational big shapes of the whole head looking for gesture, proportion and large planes. Then moving to establishing facial features and smaller planes, to eventually moving to details and refining the surface of a finished piece. The class intentions will focus on capturing the accuracy and likeness of the model, creating a gesture and pleasing composition in the surround, and showing an emotion that captures the essence of the model and captivates the viewer. A variety of clay modeling techniques will be discussed and demonstrated throughout the workshop. The class is suitable for all skill levels, from complete beginners onward, and all students will receive individual attention. 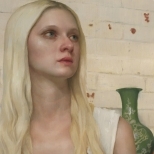 In this five day workshop students will study and sculpt a portrait from a live model, using water-based clay. This workshop will be based on the classical figure tradition of understanding the structure of the human head. We will begin with the foundational big shapes of the whole head looking for gesture, proportion and large planes. Then moving to establishing facial features and smaller planes, to eventually moving to details and refining the surface of a finished piece. The class intentions will focus on capturing the accuracy and likeness of the model, creating a gesture and pleasing composition in the surround, and showing an emotion that captures the essence of the model and captivates the viewer. A variety of clay modeling techniques will be discussed and demonstrated through out the workshop. The class is suitable for all skill levels, from complete beginners onward, and all students will receive individual attention. 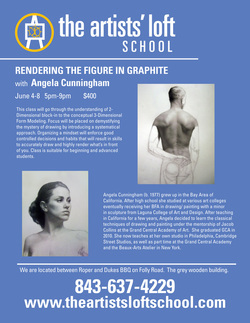 In this 3-day intensive workshop, artist Angela Cunningham will teach students to draw the Figure from observation. Working in graphite, Angela will help students understand and practice the visual tools of "blocking-in." Spending time and focusing on "block-ins" is a traditional academic training method that allows one to fine tune foundational skills for high accuracy. Over the course of the three-day workshop, each student will get a chance to organize a strategic method of thought and process to develop a clear approach to drawing. The first day, we will work with drawing from the Charles Bargue Drawing Course Figure Plates, a 2-dimensional reference, to introduce the approach and build the foundational skills required to approach a live model. During the next two days, we will apply these techniques while working from a live model, refining and internalizing the approach. Students will develop their comparative measuring and shape-seeing abilities along with patience, focus, accuracy, and observational detail. Each student can expect to walk away with a good grasp of a systematical approach to drawing the figure and multiple practice drawings. 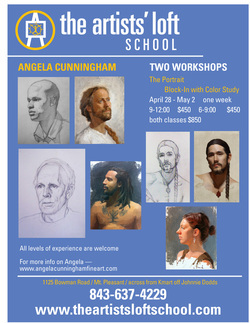 Instructor, Angela Cunningham, will give demos throughout the workshop and will advise each student one on one. Beginner and experienced students are welcome! 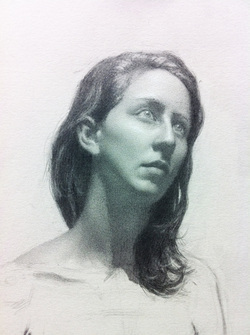 Learn to draw the Portrait from observation of a live model in graphite. Emphasis will be placed on accuracy of block-in. It is in the understanding and practicing of the visual tools of blocking-in that students will develop their comparative measuring and shape-seeing abilities. Focusing on book-ins is a traditional academic training method that allows one to fine tune foundational skills for high accuracy and likeness. Each student will get a chance to organize a strategic method of thought and process to develop a clear approach to drawing. In this class students will draw the Figure from observation in graphite. We will spend three days understanding and practicing the visual tools of blocking-in. Each student will get a chance to organize a strategic method of thought and process to develop a clear approach to Drawing. The first day students will work with drawing from the Charles Bargue Drawing Course Figure Plates giving them a chance to work from a 2-dimensional reference to grasp the approach. Then we will spend the next two days working from the live model. Students will develop their comparative measuring and shape-seeing abilities along with patience, focus, accuracy, and observational detail. Students can expect to walk away with a good grasp of a systematical approach and multiple practice drawings. Instructor will give demos through out the workshop and will advise each student one on one. Spending time and focusing on block-ins is a traditional academic training method that allows one to fine tune foundational skills for high accuracy. Click here to be redirected to their site. 5-day Traditional Figure Drawing Workshop. ​Sign up now to save a spot! I will be offering a free Figure Drawing Demonstration from a live model in Raleigh, NC at the Alia Fine Art Studio. Using graphite I will share my classical approach to accurately blocking in the entire figure and then proceed to modeling the form with subtle value shifts. 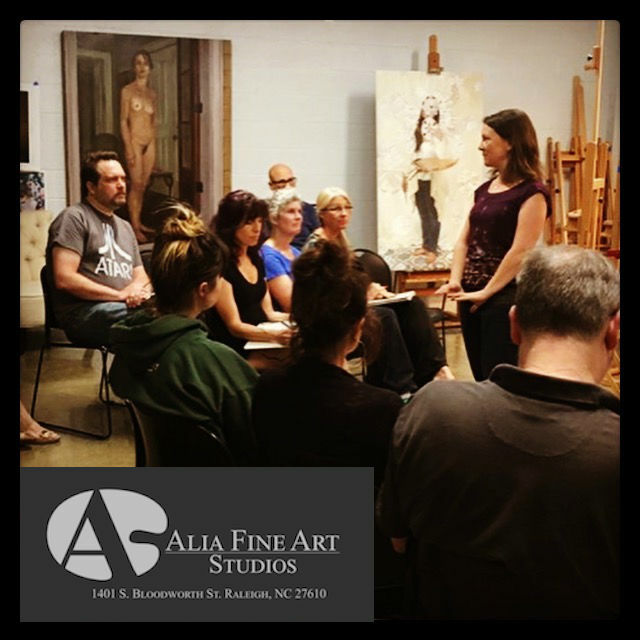 The audience for this course is the beginning artist and the intermediate student who wants to be grounded in the atelier method of drawing and painting from the ground up. At the core of our visual literacy program is our firm belief that anyone can learn to draw and paint at any age, when provided the appropriate instructions. These one month intensive programs will provide the ‘student’ artist with the core training required to advance their skills as artists. 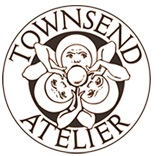 These intensives will give students a chance to fully immerse themselves in the classical atelier techniques of Drawing and/or in Painting. The instructor will have a chance to fully introduce and explain the whole process from the start of a block-in to completing a fully rendered drawing or finished painting. The first day of the workshop will cover the understanding of 2-dimensional block-in using pencil on paper. Having an accurate block-in is the most important stage to drawing and painting. We will work with analyzing and improving our way of seeing to be more accurate to life. Students will learn to see flat shapes (mass drawing) to become more visually abstract with their thought process. Comparative measuring, angles, and alignments as necessary tools to use in a systematical approach will also be covered. On the second day students will learn how to do an oil transfer of their drawing to canvas, as well as how to complete a one day color study. The rest of the week we will use the understanding of hue, value and chroma to paint 3-Dimensional Form. Organizing a palette as well as a mindset will enforce good controlled decisions and habits that will result in skills to accurately draw and paint what you see. Angela Cunningham has become one of our regular visiting instructors and we are thrilled that she will be joining us to teach a three day workshop this summer. Portrait sketches and color studies are a great way to develop your decisive decision making skills. 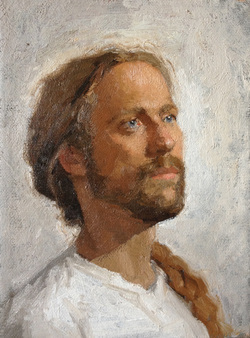 Working from a model, this portrait workshop will take you through all of the steps, from learning how to draw the portrait and how to choose the right colors to accurately capture a likeness on canvas in oil paint. The first half of the workshop will be focused on drawing from observation in graphite. Emphasis will be placed on practicing the visual tools of blocking-in. Students will develop their measuring and shape-seeing abilities. Then the second half of the workshop students will finish with a Color Study. Students will focus on using form and color to create a 3 dimensional likeness of the model. Angela will cover the understanding of hue, value and chroma. Organizing a palette as well as a mindset will enforce good controlled decisions and habits that will result in skills to accurately draw and paint what you see. Model fee is included in the cost of the workshop. There will be a one hour lunch break each day. Lunch is on your own. Sketches or color studies are a great way to develop your decision making skills. In both these classes, still life and portrait, we will use the first hour of class focusing on block-in. We will draw directly with paint on the canvas. Then we’ll spend the next four hours of class focusing on form and color to create a 3 dimensional likeness of the subject. Comparative measuring, angles, and alignments, along with hue, value and chroma will be discussed. Organizing a palette as well as a mindset will enforce good controlled decisions and habits that will result in skills to accurately draw and paint what you see. 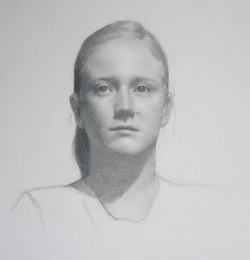 In this three-day workshop, students will draw the portrait from observation in graphite. Emphasis will be placed on accuracy of block-in. It is in the understanding and practicing of the visual tools of blocking-in that students will develop their measuring and shape-seeing abilities. Focusing on block-ins is a traditional academic training method that allows one to fine tune foundational skills for high accuracy. Each student will get a chance to organize a strategic method of thought and process to develop a clear approach to drawing. Beginner and experienced students are welcome. Model fee is included in the workshop. There will be a one hour lunch break each day. Lunch is on your own. Block-in: The first 3 days of workshop will cover the understanding of 2-dimensional block-in. As having an accurate block-in is the most important stage to drawing and painting, we will spend the first few days analyzing and pushing our way of seeing to be more accurate. We will learn to see flat shapes (mass drawing) to become more visually abstract with our thought process. We will also cover comparative measuring, angles, and alignments as necessary tools to use in a systematical approach. On Fourth day we will begin Modeling in Paint. We will cover the understanding of hue, value and chroma, doing a color study and how to do an oil transfer. The rest of the week we will learn to use color and paint to create the understanding of 3-Dimensional Form.Organizing a palette as well as a mind set will enforce good controlled decisions and habits that will result in skills to accurately draw and paint what you see. For students that wish to sign up for just one week; we will cover block-in and a color study only. 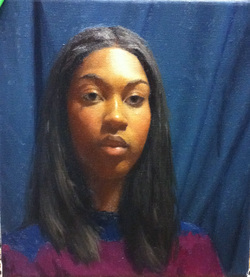 Students who can take both weeks will cover block-in, color study, oil transfer and a final painting. CLASSICAL CAST DRAWING | with Angela Cunningham NEW CLASS! 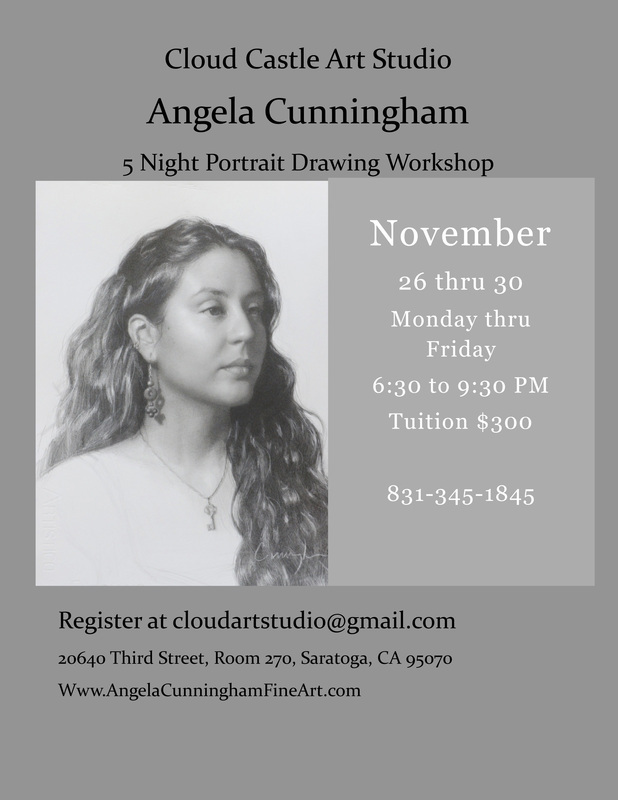 Three week intensive at Wendy Chuang Fine Art Studio. Same model all three weeks. Week 1 - Block-in Drawing. Learn to get an accurate drawing using a systematical approach. We will discuss Mass Drawing, Proportion, Comparative Measuring, and visual flatting tools. Week 2 - Form Modeling in Graphite. Using a systematical approach we will conceptually analyze gradations and planes thinking sculpturally. Best way to learn Form Modeling is with Graphite. It helps to grasp the concepts of Form Modeling with out the extra burden of color and paint application. Week 3 - Form Modeling in Paint. We will cover doing a paint transfer of our drawing from week 1, doing a color study, palette set up, color and Form Modeling in Paint. all levels, Beginning to Advanced Students welcome. 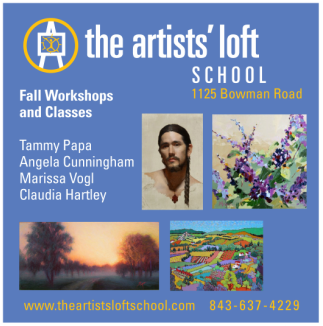 I will be returning to teach two workshops at The Artist Loft School in Charleston, South Carolina . Both Classes open to all levels, Beginning to Advanced Students. 5 Weeks, July 9 to August 10, 2012. 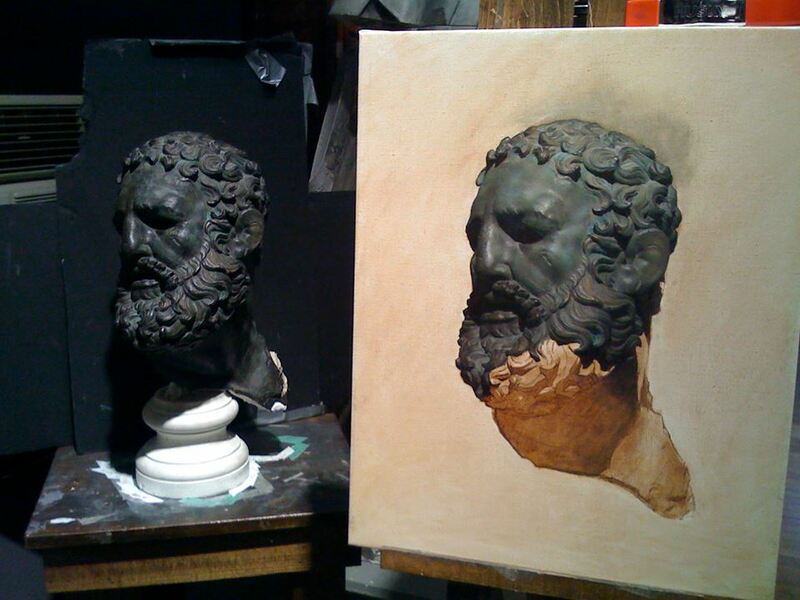 CAST DRAWING: In this class you will draw from plaster casts of classical sculpture. You will learn how to see shapes accurately, create a truthful drawing, and, by cultivating a profound understanding of light on form, render three dimensions with a high degree of sensitivity and fidelity. 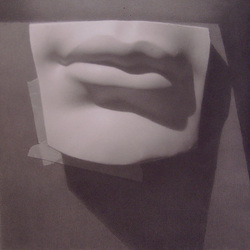 PORTRAIT DRAWING: In this class you will create a portrait in graphite from a live model. Blocking-in, measuring, materials handling, and the intricacies of light on form will all be covered in-depth. Learn powerful drawing technique and theory while capturing the gesture, expression and likeness of your subject. 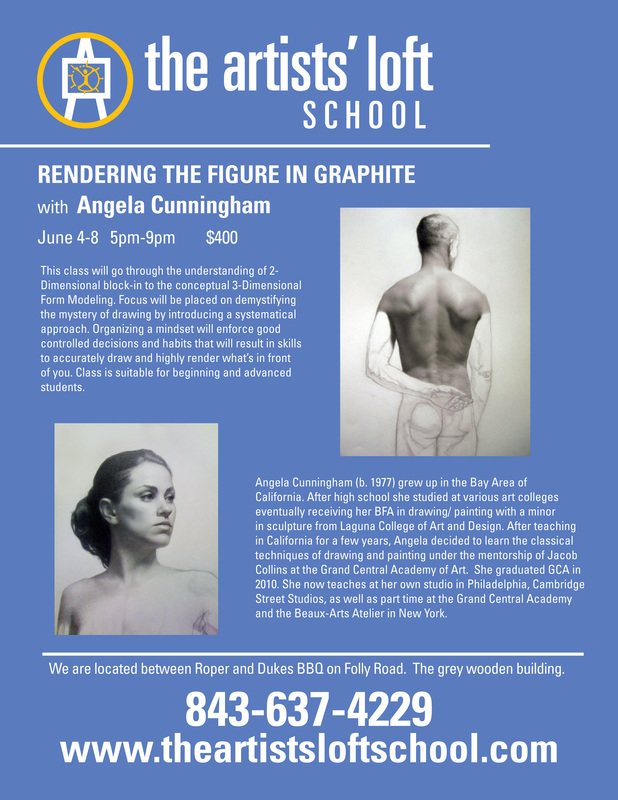 This class will present a concrete process for creating accurate figure drawings. Shape-seeing, decision-making, measuring, materials handling and other techniques will be covered in depth. Students will learn to draw with purpose, problem solve and make confident decisions, while developing a set of tools for evaluating and correcting their work. Suitable for beginning to advanced students. In this class students will learn how to create a convincing illusion of three dimensional forms in paint. This class will cover setting up your palette, how to do an oil transfer, a one day color study, and modeling form in paint.